it all started with Chrono Trigger...: Elementary! The anticipation of PAX next week has been incredibly distracting. Although I have been playing a TON of games lately I just can’t seem to find the time to write about them. Until today! I have about six shots of espresso in my system and (Do You Want to Date My) Avatar? on repeat (if someone can explain the term ‘tank & spank’ to me I would be eternally grateful) so I am revved up to talk about my latest game: Sherlock Holmes vs. Jack the Ripper! I know, it sounds terribly dull and most of your eyes have probably glazed over, so I figured it was probably better for everyone if I defended this little sleeper of a game with as much faux energy as possible. Let me first confess that this wasn’t a game I sought out intentionally-it was definitely a GameFly Q filler. In between all of the spring releases and “Coming Soon” fall releases, Sherlock Holmes seemed like mild entertainment even if its rating is incredibly low. I have a soft spot for Jack the Ripper…wait, I am saying that wrong…I have a morbid curiosity about the unsolved Victorian case, which I can always defend by using the following phrase: “I was an English History major in college”. As a history major, I think it’s interesting to follow all of the ‘theories’ floating around as to the identity of the killer. Alan Moore pointed at Sir William Gull, the Queen's physician, in From Hell, one my favorite graphic novels, and Patricia Cornwell 'solved’ the crime a few years ago by highlighting Walter Sickert as the notorious Whitechapel butcher. Last time my mother & I were in London we took a “Jack the Ripper Walk” that included all of the infamous murder spots and ended in the Ten Bells Pub-a delicious late night tourist activity. When I asked our tour guide in London, who was also part of a group of Ripperologists (not my term, theirs), if he thought Cornwell has solved the case he scoffed and said “hardly” with an elitist smirk. It was beautiful. So I was interested to see how the game would pan out-which of the usual suspects would the game developers pinpoint? And if so, would they have a theory why the crime is still officially unsolved? 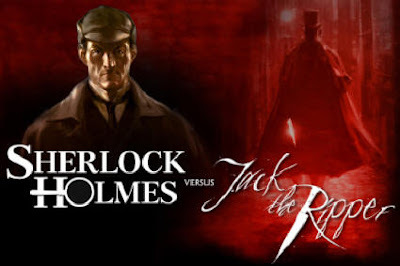 While playing Sherlock Holmes vs. Jack the Ripper it’s best to turn the sound off and just read the dialogue on the screen, as though you are investing in a fantastic mystery novel. Because the voice acting is so bad. I could swear they didn’t even find English actors for this-just told a bunch of Americans to give ‘em their best Cockney and go to town with it. The NPC prostitutes and vagrants wander the streets of Whitechapel like zombies with dirty cheeks and pox scars always responding the same way-'it's cold, guv, let's go somewhere and get warm'. Blech. And its chock full of bugs-once I got a bug that was so bad I couldn’t even see the screen anymore and had to reset the console. Characters jittered all of the time, passing their hands back and forth through solid objects, and once I had to wander around for AGES to find a tiny toothpick of a stick I was looking for to advance. I walked by it 100 times beforehand without the interaction icon appearing-seriously problematic. I have a hunch that the developers intended this to be a PC-only game and the port to the 360 was a well intended afterthought (cha-ching!). But through all of the hurricane sized issues, I enjoyed the many hours I spent within the game. As I said earlier, the Jack the Ripper mystery is relevant to my interests, so it gave me the feeling that I was helping to solve the notorious 19th century case. The gameplay is investigative-looking for clues, talking to witnesses and solving puzzles. And the puzzles within the game were well thought out and fun to solve, even if sometimes you were presented with one without ANY guidelines and scratched your head for awhile. I admit, one of them made NO sense to me WHATSOEVER and I was forced to turn to the internet for assistance (how the hell did they figure that out? Those walkthrough folks are geniuses, I swear). The background was actually quite pretty in a dark and gritty Industrial Revolution kind of way. The most captivating aspect of Sherlock Holmes was definitely the progressive investigation elements. There were murder boards to deduce, timelines to consider and ah-ha! moments to savor. Every night I would get to a point where I would think, I should probably go to bed now, its midnight:30, and Sherlock would say, ‘Let’s go visit the cobbler’ and I would follow like a hypnotized puppet. Just one more conversation, I swear. The game never held back the gory details of the historical crime scenes. While picking up clues on the victim’s bodies you used a magnifying glass on slashed necks, protruding tongues, missing noses or eyelids (syphillis) and once you even examined a bruised and shredded hand to determine that the victim’s rings had been taken-you knew because of the black markings around her middle finger. Only the last victim wasn’t shown or picked over for clues-they alluded heavily to the idea that we, the audience, wouldn’t want to even contemplate what happened to Mary Kelly in 13 Miller's Court. Even the normally unaffected Holmes rambled about in some sort of trauma-induced trance for a few minutes before shaking out of it a few moments later. Gross, I know, but I really appreciated the care they took with the basic history of the story-adding the right marking details, areas of London and a few of the real suspects for us to consider. And to be honest, these details are what drew me back night after night. In the end they did, indeed, ‘name’ a killer (who did some sort of murderous interpretive dance for Holmes under a spotlight at the end-and I am totally serious about this) and the reasons for Holmes not telling the public, but for spoiler reasons, I won’t divulge their conclusions.